Scientists propose a dust cloud made of asteroid material could help to cool Earth. 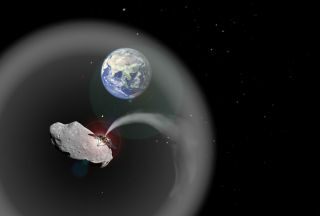 Here, an artist's depiction of what a spacecraft spewing asteroid dust might look like. The world is warming and the climate is changing. Although many want to prevent these shifts by reducing emissions of greenhouse gases that trap heat from the sun, some controversially suggest deliberating manipulating the planet's climate with large-scale engineering projects, commonly called geoengineering. Instead of altering the climate by targeting either the oceans or the atmosphere, some researchers have suggested geoengineering projects that would affect the entire planet from space. For instance, projects that reduced the amount of solar radiation Earth receives by 1.7 percent could offset the effects of a global increase in temperature of 3.6 degrees F (2 degrees C). The United Nations' Intergovernmental Panel on Climate Change (IPCC) has noted climate models suggest average global temperatures will likely rise by 2 to 11.5 degrees F (1.1 to 6.4 degrees C) by the end of this century. Now instead of having a dust cloud floating by itself in space, researchers suggest an asteroid could essentially gravitationally anchor a dust cloud in space to block sunlight and cool the Earth. "I would like to make it clear that I would never suggest geoengineering in place of reducing our carbon emissions," Bewick told LiveScience. Instead, he said, "We can buy time to find a lasting solution to combat Earth’s climate change. The dust cloud is not a permanent cure, but it could offset the effects of climate change for a given time to allow slow-acting measures like carbon capture to take effect." The researchers calculate that the largest near-Earth asteroid, 1036 Ganymed, could maintain a dust cloud large enough to block out 6.58 percent of the solar radiation that would normally reach Earth, more than enough to combat any current global warming trends. Such a cloud would be about 11 million-billion pounds (5 million-billion kilograms) in mass and about 1,600 miles (2,600 kilometers) wide. Ganymed has a mass of about 286 million-billion lbs. (130 million-billion kg). An asteroid of this size might make one think of disaster movies, such as "Armageddon"; however, "rather than destroying the Earth, it could be used to help mankind," Bewick said. The main challenge of this proposal would be pushing an asteroid the size of Ganymed to the sun-Earth L1 point. "The company Planetary Resources recently announced their intention to mine asteroids," Bewick said. "The study that they base their plans on reckons that it will be possible to capture an asteroid with a mass of 500,000 kilograms (1.1 million lbs.) by 2025. Comparing this to the mass of Ganymed makes the task of capturing it seem unfeasible, at least in everything except the very far term. However, smaller asteroids could be moved and clustered at the first Lagrange point." Also, there's no way to fully test this dust cloud on a large scale to verify its effectiveness before implementing it, "something that is common to all geoengineering schemes," Bewick said. "On the global scale, it is not possible to test because the test would essentially be the real thing, except probably in a diluted form. Climate modeling can be performed, but without some large-scale testing, the results from these models cannot be fully verified." Still, if geoengineers did use asteroids to generate clouds, they could drastically reduce how much dust the projects spew out "should any catastrophic climate response be observed," Bewick said, "with the cloud dispersing naturally over time." The scientists will detail their findings in the Nov. 12 issue of the journal Advances in Space Research.